No clients will be contacted on the day of travel. Eating, drinking, smoking and the use of drugs is prohibited when boarding the coach, including electronic cigarettes. 15 minutes prior to departure time. Call us on +27 39 312 1406 with flight check-in time should a delay occur to enable us to see if we can assist with our next available coach. Please note that we are not liable for flight delays and we will only be able to assist as best we can on the day. Clients that adhere to the 90 minutes connection leeway will not be charged a re booking fee. Clients that do not adhere to the 90 minutes connection leeway will be charged a R40.00 re booking fee. We do not work on a refund basis but can keep your ticket on credit provided the cancellation is not less than 24 hours prior to the scheduled departure time. For emergency cancellations i.e the passenger has fallen ill or a family member has passed away and the passenger is no longer able to travel will need to be accompanied by a letter of admission to hospital or a death certificate. Once you have collected your luggage, look for Standard Bank. 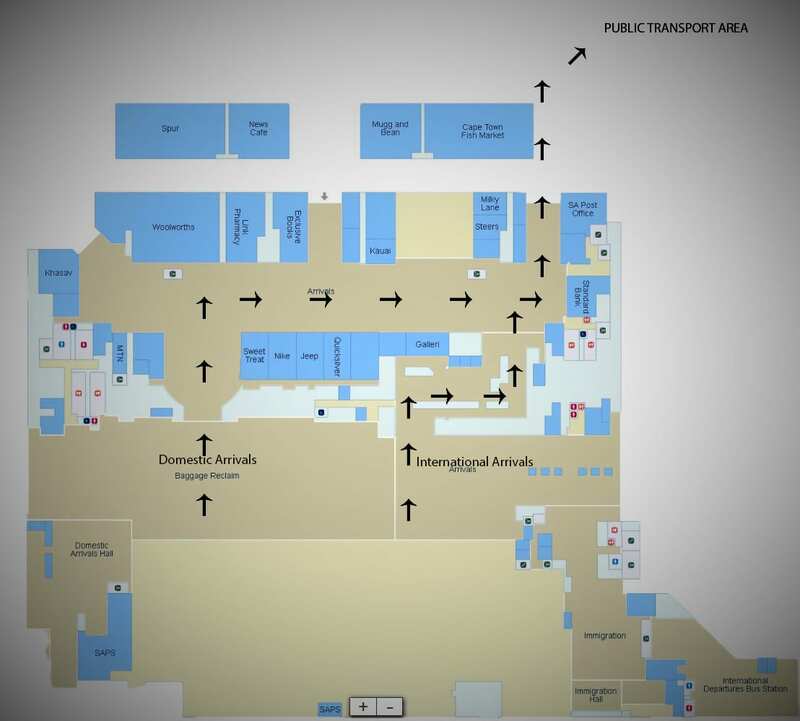 Take the Standard Bank exit on your left and the Public Transport Area is on your right. Tickets that are cancelled shall not be refunded, but provided that same is done at least 24 hours prior to a departure time, an alternative booking (“the re-booking”) may be done for the next available seat on the same route and for the same passenger as the initial ticket. If such a re-booking is not done within the aforesaid 24 hour period no re-booking may be made. No more than one re-booking will be allowed per ticket issued. Any increase in the cost /price of the ticket will be for the account of the passenger, payable immediately on making the re-booking. Any request for a re-booking must be accompanied by the original ticket. The reservations agency and/or Margate Coaches may at their own discretion, levy an administrative fee for a re-booking. Re-bookings may be made at Margate Coaches offices or at the authorized agency where the ticket was bought originally. The passengers name, surname, contact number and emergency contact number. Kindly call our reservation line on +27 39 312 1406 to make the booking manually. Payment can be made with a Visa or MasterCard, Credit, Debit and Cheque cards are accepted as long as it has been opened to online purchases. Privacy and Security: Using a card to purchase Margate Mini Coach tickets is safe. All personal and card information is encrypted through secure server software to prevent any third party access to your data. Unless you are in possession of a medical certificate stating that you are fit to travel, you are advised not to make a booking and board any any of our coaches. Local travelers are entitled to one standard suitcase and one carry on. International travelers are entitled to two standard suitcases and one carry on. A charge of R50.00 can be made for any extra or non standard luggage. Note that Margate Coach / Margate Mini Coach has basic insurance for lost luggage, each passenger should ensure they are adequately insured. If you cannot locate the bus or driver, call us on +27 39 312 1406 for assistance. All Margate Coach / Margate Mini Coach tickets are strictly nominative and non-transferable between persons. This means that it isn’t possible to change or modify the name on a ticket. Should you fail to check in within the allocated time prior to scheduled departure or board at the stipulated time, you will be regarded as a no-show and will forfeit your seat as well as the fare that is allocated to that leg of your reservation. A no-show is not entitled to a refund for the value of the service missed. When booking our service it is not necessary to collect the ticket(s), one may board with the reference number received after paying for your ticket. Unfortunately not, one would need to provide their own. Bookings are available online click here to book now, through our reservation line on +27 39 312 1406, Pick n Pay Nationwide, Shoprite Nationwide, Checkers Nationwide, selected agents along the South Coast and at any Greyhound store nationwide. Companies and institutions doing most in their sectors over the past 12 months to stimulate the economic growth and development of the KwaZulu-Natal South Coast Region.